Author(s): Angelo Verzoni. Published on March 1, 2018. Similar scenarios have played out at other distilleries in Kentucky, which is home to many of the country’s largest whiskey makers. In 1996, a fire broke out at Heaven Hill Distillery, also located in Bardstown, and burning whiskey created what one employee described to The Kentucky Standard as “a river of fire.” In 2000, a fire at a Wild Turkey distillery in Lawrenceburg destroyed nearly 1 million gallons of bourbon. Incidents like these illustrate the flammability of hard liquor, usually 40 percent alcohol by volume (ABV) or higher, and it's why commercial and industrial property insurers like FM Global have conducted research on how to keep stored spirits safe from fire. The FM Global research shows that, while fire sprinklers are typically effective at suppressing flames for rack-stored spirits where barrels are stored on their sides, wide flue spaces are essential in palletized configurations where barrels are stored upright. The combination of the upright barrels, which trap water flowing from ceiling sprinklers, and a lack of adequate flue spaces between palletized stacks can prevent water from reaching the fire. It's not just the storage of spirits that's a hazard. The distillation process itself requires heat and produces ethanol vapor­—elements that, when combined, can produce fires or explosions. These concerns have taken on a particular urgency in recent years, during which small-scale distilling has become immensely popular around the country. Like the craft brewing movement before it, craft distilling is expected to keep growing. There are over 1,000 so-called craft distilleries—where liquor is made in typically small spaces by equally diminutive staffs, often just a few people—scattered across the country, and experts worry the production and storage of spirits at some of these facilities could be occurring with little regard for fire safety. In January, the Pittsburgh Fire Department was called to Wigle Whiskey, a craft distillery that opened in 2012 in the city's Strip District. When firefighters arrived, they discovered that a boiler inside the distillery, located in a mixed-use brick building about 70 feet from an apartment complex, had exploded. Fire did not break out, but one employee suffered minor injuries. While losses from the incident were minimal, it illustrates why there's concern over these facilities: you never know where they're going to pop up. Although the Heaven Hill Distillery fire of 1996 was a massive blaze, jumping from one warehouse to another and decimating what was at the time two percent of the world's whiskey stock, it burned only on the facility's sweeping plot of rural Kentucky land. But that luxury of seclusion isn't afforded to the many smaller distilleries located in repurposed buildings on dense city blocks. What if, for example, a fire had broken out after the Wigle Whiskey boiler explosion and spread to nearby apartments or other businesses? The fire hazard of making and storing distillates can be significant. According to data in a 2005 version of the fire protection manual created by the Distilled Spirits Council of the United States (DISCUS), pure ethanol—the alcohol present in spirits, beer, and wine—releases more than half the energy of 100-octane gasoline when it burns; the gasoline releases 20,750 BTU per pound, while ethanol releases 12,800 BTU per pound. The figure is much lower for ethanol-water solutions measuring 40 percent ABV—the level of alcohol present in 80-proof distilled spirits—at about 4,300 BTU per pound. Flashpoints, or the temperature at which liquids give off enough vapor to ignite in air, also shed light on the dangers of distilling. The flashpoint of pure ethanol is 55 degrees F—well below room temperature—while the flashpoint of a 40 percent ABV solution is 79 degrees F.
When fires involving spirits do break out, they can result in much more than a monetary loss. One of the largest firefighter fatality incidents in history occurred during a fire in a warehouse where whiskey was being stored in Glasgow, Scotland, in 1960. Nineteen firefighters died in the blaze, known as the Cheapside Street whisky bond fire. “As the temperature of the fire increased, the spirit casks in the warehouse had begun to rupture. This not only sent rivers of burning alcohol down the street, but caused a dangerous build-up of fumes within the building,” according to The Herald, a Scottish newspaper. Besides location, there are also concerns over who owners are willing to let inside the facilities. A feature common to almost every craft distillery is a tasting room, where visitors of legal drinking age can sip free or inexpensive samples of the business's products. Some distilleries offer tours as well, where participants can get face to face with the equipment used in the distillation process. These different uses create a mashup of occupancy types and classifications, like an assembly occupancy merged with an industrial occupancy containing hazardous materials. Elliot Gittleman, a fire protection engineer who consults for both the public and private sectors in the San Francisco area, tells the story of a distillery in Nevada that wanted to have visitors walk onto a deck overhanging the whiskey processing area. “I said, 'Unless you want to buy a lot of expensive fire-rated glass, you will not be able to get building department approval,'” he says. Gittleman's point gets to the crux of the issue—even though authorities having jurisdiction (AHJs) might recognize the risk posed by distilleries in their areas, they have little to reference to enforce fire-safe practices. While the distilling industry has been self-regulating for decades, the craft boom raises the question of whether additional guidance can or should be provided by organizations like NFPA. NFPA codes and standards and other codes like the International Fire Code (IFC) don't include information specifically about distilling—a result of the industry's history of lobbying and self-regulation. Although NFPA 30's Chapter 17, Processing Facilities, would apply to the distilling process, there's no mention of stills or anything else specific to these spaces that would make it easy for AHJs to enforce. The code excludes spirits from its chapters on storage. “[AHJs] need something more in a code to help them know what to look for and what hazards are being presented,” Gittleman says. The DISCUS fire protection manual, a product of input from large distillers like Jim Beam, provides a lot of this information in a relatively easy-to-digest manner. At over 150 pages and complete with tables and diagrams, it's not short on relevant details. It references numerous NFPA codes and standards, such as NFPA 13, Installation of Sprinkler Systems, and NFPA 72®, National Fire Alarm and Signaling Code, and stresses stringent fire protection measures. “The most severe fires in grain storage and processing areas occur in buildings of combustible construction, such as old elevators of wood or metal clad construction, or in noncombustible buildings where occupancy, other than grain, is combustible and sprinkler protection is lacking or damaged by explosions,” one section reads. 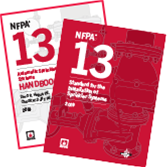 Install state-of-the-art sprinkler systems with the comprehensive NFPA 13 Standard and Handbook Set! The lack of guidance within commonly used codes and standards has led to a lack of knowledge among craft distillers and the fire service around some of the dangers of these facilities, according to Gerczysnki. One of the most dangerous aspects of distilling, Gerczysnki says, are the alcohol vapors that not only can emanate from the distilling equipment, but also from the barrels or casks of stored distillates. Colloquially known as “the angels' share,” industry sources say as much as one percent of a cask's contents can be lost through evaporation each year. There's so much alcohol vapor in the air at some distilleries that they've implemented methods to collect and reuse it. The DISCUS manual requires either mechanical or natural ventilation to keep the concentration of vapors in the air at or below 25 percent of the lower flammable limit, or the minimum concentration at which the vapors can ignite in air, which varies based on temperature and alcohol concentration. “This should be confirmed by sampling the actual vapor concentration under normal operating conditions,” the document reads. Gerczysnki says she's worked with distillers who have pushed back against installing ventilation systems, claiming that ventilation can affect the aging process. But she's mostly won them over, she says, by arguing that the negative impact of a catastrophic fire would far outweigh that of a properly functioning ventilation system. At least one widely used code will soon acknowledge distilling. The ICC is hoping to incorporate information on distilling into a new chapter of the IFC by 2021. “What we're trying to do is give distilleries a place in the code so that they're regulated but also not overregulated,” says Kevin Reinerston, deputy fire marshal in Riverside County, California, near Los Angeles, who chairs the IFC workgroup writing the chapter. Gerczysnki is also part of the group. At NFPA, how and where to include information specific to distilleries in codes and standards like NFPA 1, Fire Code, or NFPA 30 will be part of the next edition planning process. Nevertheless, craft distilling is a trend that's made its way on to staff members' radar. “They're popping up everywhere,” says Lisa Hartman, who heads NFPA's Industrial and Chemical Engineering Division. “Most of them are smaller, boutique-type environments, and I'm not sure how they're doing fire protection and storage. It is definitely a concern. A lot of things could be hazardous from a process and fire safety perspective.” Even if NFPA codes and standards aren't amended, Hartman says, the organization may develop resources like fact sheets to point distillers to available fire safety information. Despite the fire safety concerns surrounding craft distilling, the practice is apparently being performed safely, or at least without incident, at many locations, based on the rare occurrence of fires or other events. Over roughly the past year, just a handful of news reports were generated by fires or explosions at U.S. distilleries. Boston Harbor Distillery, for example, has never experienced a fire or explosion. Located in a 160-year-old post-and-beam mill building near downtown Boston, the distillery has been producing rye whiskey and other spirits for the past three years. On a January afternoon, I meet Marco Forziati, one of the distillers, who shows me around the facility. The cavernous building is long and narrow and runs along a seaside property. The distilling space houses rows of metal tanks, tubes, pipes, and other equipment, and is separated by glass and thick wooden beams from a tasting room and event space. The distillery certainly appears to take safety seriously. “Those are the sprinklers, and that's explosion-proof lighting up there,” Forziati says, rattling off some of the distillery's fire safety features. “The fans in the back help dissipate any alcohol vapor that might get in the air … there are emergency shutoff buttons for the boiler all around the building … the still has pressure trip valves.” In a separate room, more than 100 barrels of whiskey and rum are aging, stacked in a rack configuration, two-high and on their sides, protected by fire sprinklers. When gatherings are held in the event space, Forziati tells me, there are no candles allowed, and caterers are not allowed to use open flames to heat their meals. When the distillery was being built, NFPA codes and standards like NFPA 13 were used, as was the DISCUS fire protection manual.